Book of the Week Book of the Week: A Pick by Christopher J Johnson Christopher J Johnson selects The Moon 1968-1972 by Tom Adler as Book of the Week. The Moon 1968-1972. Edited by Evan Backes & Tom Adler. Christopher J Johnson selects The Moon 1968-1972 Edited by Evan Backes & Tom Adler from T. Adler Books as Book of the Week. "Nothing like the sun and nothing like cheese or a face or, even, a stone – the moon, I have just discovered, is a slowly dissolving cube of sugar eaten around its edges by a drip of coffee, and the liquid of that coffee is space itself. Of course, not really – in reality, the moon is a coreless stone (by which I mean, the moon has no fire in its belly – which is unlike most other moons, Io or Titan for example). Even though we honestly don’t know how our moon was created, most likely it is an amalgam of the earth we stand upon and another stone (also coreless) that struck our planet a very very long time ago causing a portion of its mantel to tear away while simultaneously melding with the foreign rock which had struck it and, then, got caught in the Earth’s gravitational pull and, furthermore, over time smoothed it down to the shape it has today. So, when we first landed there in 1969, it was a cube of sugar; of course not literally, but it does look that way in many of the pictures; its surface too grey or too white and the small horizon it has (a horizon, if you can picture it, that is about 63% less than the horizon of the earth) too small. None of this information is contained in The Moon 1968-1972, but various different ideas about the moon and what it is or what it might mean to us as a people are included; from John F. Kennedy and E. B. White’s interpretations, to a transcript of the Apollo 12 space crew as they are about to touch down on the moon (“I’ll tell you, I may be blind, but that looks grey as hell to me.” says Alan L. Bean in the transcript). 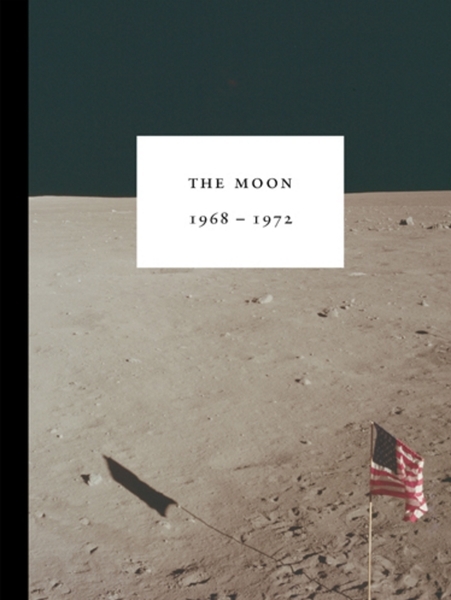 The book itself is almost an homage to the moon and the astronauts’ experience of viewing it or walking upon it; the blacker than black end papers, the white space around the photographs like a bit of lunar dust or the view from a lunar lander’s window. Is this something of a shared cultural history? Looking again at these photographs – again, because, after all, we have seen these photos again and again – I’m actually not sure. The Moon 1968-1972. Edited by Evan Backes & Tom Adler. T. Adler Books, 2016. Christopher J Johnson lives in Santa Fe, New Mexico. 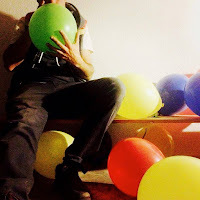 He is a resident writer for the Meow Wolf art collective and book reviewer for Garth Clark’s Cfile Foundation. His first book of poetry, &luckier, has been released by the University of Colorado. He is, as of 2016, Manager of photo-eye’s Book Division.